Last night we decided to visit the recently opened Champa gne Bar – Eclectic Fizz. Wow is my first impression! Aberdeen has severely lacked this style of venue. Upon entering we were greeted at the bar with the Champagne menu. Offering over 30 champagnes from non-vintage to the more extravagant bottles. 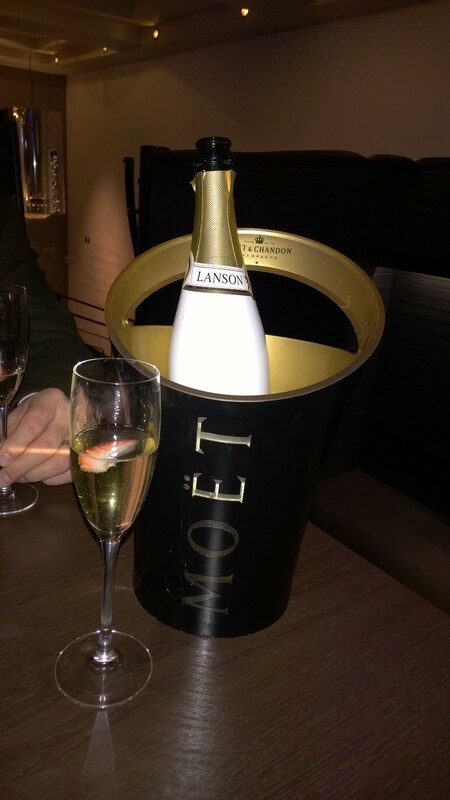 We settled on a bottle of the Lanson White Label, priced at a reasonable £55. The bottle was served beautifully chilled including a selection of fruit. The drinks menu also includes premium wines and extensive cocktail menu – all very appealing! The setting of Eclectic Fizz is very modern over two floors with plentiful seating areas giving the bar a very open and relaxed setting allowing you to enjoy your bubbles and company. Eclectic Fizz also offer a food menu, which I will most definitely be back to try. S uch a welcome addition to Aberdeen I wish the owners every success and I look forward to making Eclectic Fizz a regular visit when out in Aberdeen. Eclectic Fizz is located at 150 Union Street, Aberdeen. AB10 1QX.